Distribution: The valley elderberry longhorn beetle inhabits California’s Central Valley and can be found in the vicinity of Redding in southern Shasta County to the Bakersfield area in Kern County. Although critical habitat for the species has been designated along Putah Creek and the American River, there are no known occurrences of the beetle within the Natomas Basin. Blue elderberry, the host plant for this species, occurs in riparian areas along the Sacramento and American Rivers bordering the basin, but it does not occur in the clay soils that dominate most of the central and northern basin. However, isolated blue elderberry shrubs do grow in alluvial soils along the western edge of the basin. Habitat Requirements: The valley elderberry longhorn beetle lives exclusively on elderberry shrubs (Sambucus spp. ), which generally grow in riparian areas. Areas supporting the highest numbers of beetles are those where elderberry bushes are abundant and scattered through riparian forests of cottonwood, alder, sycamore, walnut, willow, wild grape, and other riverside trees and vines. Reproduction and Demography: From March to June, adult beetles emerge from the stems of elderberry plants to mate and lay eggs. When the eggs hatch, the larvae tunnel into the elderberry stems and feed on the spongy pith (plant material inside the stems), where they remain for one to two years. When they are ready to pupate, the larvae bore an exit hole to the surface of the elderberry stem, pack the hole with wood shavings, then return to their pupal chamber where they eventually become adults. When mating season arrives, the beetle dislodges the plug of wood shavings and uses the exit hole to reach the surface of the elderberry branch, starting the cycle again. Movement: As adults, valley elderberry longhorn beetles move freely between elderberry shrubs. Ecological Relationships: The valley elderberry longhorn beetle completely depends on the elderberry plant, a shrub or small tree in the Sambucus genus. The elderberry provides food for adults (leaves) and the larvae (pith), mating grounds, egg nursery, a protected area for larvae to develop, and shelter for adults. 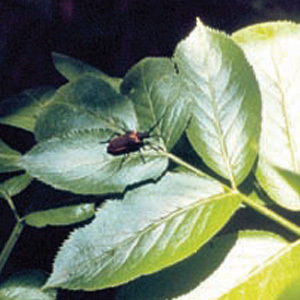 Introduced insects, such as European earwigs and Argentine ants, are known to prey on different stages of the valley elderberry longhorn beetle. Other predators include lizards and birds.